Oh my goodness! This summer has already been a whirlwind of activity. Between school ending, an internship starting, summer semester starting, working with a temporary move, and travelling to six different states in the space of 4 weeks, I am EXHAUSTED! I should be studying for my chemistry class right now, but I want to take a break from that to catch up on my blog. 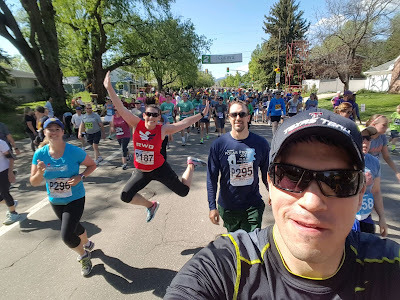 I realized that I haven't yet gotten around to writing about my experience at May 31st's Bolder Boulder 10K, so I'm going to use this study break wisely. 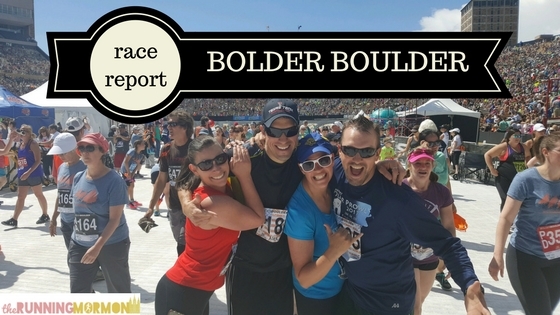 The Bolder Boulder is a well-known race. In fact, it's huge! 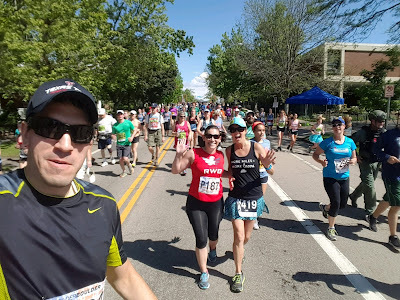 I think it's the largest race I've ever run. There were over 50,000 people there! With all these people, the race was very well organized. Runner waves were leaving every 5 minutes or so in a fairly orderly manner. 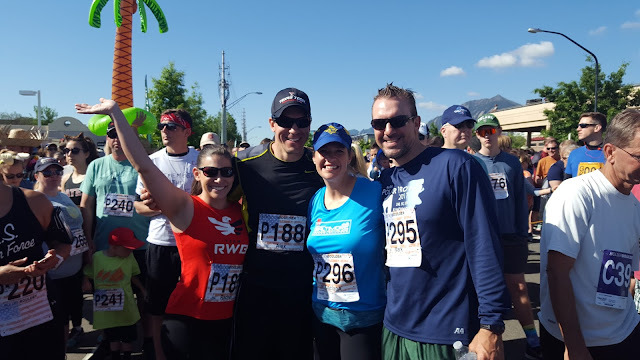 Myself and my family signed up to run in the military run/walk wave. I'm still recovering from my last relapse of Grave's Autoimmune Disease, so my endurance and strength aren't even close to where they used to be. This race turned out to be a great 10K to move slowly through and enjoy. Due to Alex's sign, we had a specific running order so that it wouldn't be confusing. 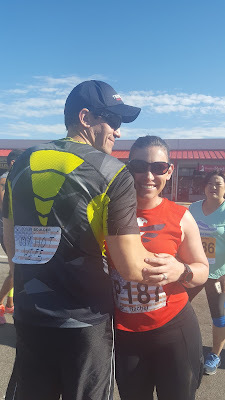 All throughout the race course there were slip 'n slide stations, bacon stations, dessert stations, bands, and a bunch of other activities going on. It was like one big party, and I guess it really was a party! There were so many people, and since our wave was one of the later waves to start, the throng of people was moving more slowly, but this took a lot of pressure off me to go faster than I probably should, being as sick as I have been. In fact, with the slower pace, I was able to run farther straight than I had for months--4.25 miles! I was feeling pretty proud of myself. 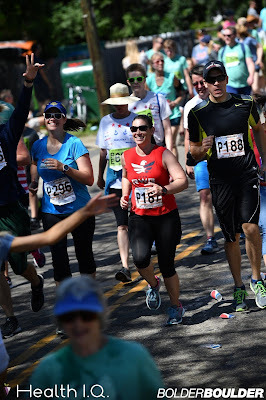 This run was so fun that I had to jump for joy. Apparently today, I'm feeling like puns. 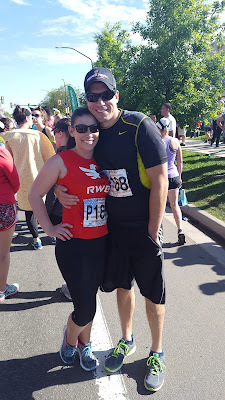 The part that made this race so fun, aside from all the fun happening within the course, was that my family ran the whole 10K with me and stayed with me the entire time. My amazing husband, and my in-laws Mark and Daciana. 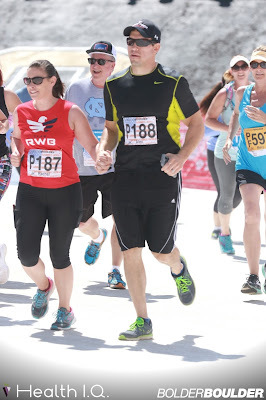 It was a blast to run this race with them, especially when Mark leapfrogged over Alex while he was just running along. I was impressed. Toward the end of the race, I even ran into a fellow Skirt Sports Ambassador. 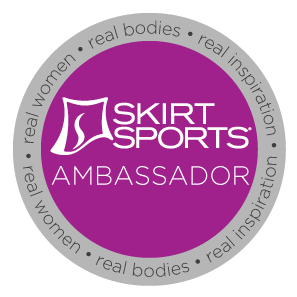 That's a nice thing about Boulder, there are a lot of fellow Skirt Sports enthusiasts around. 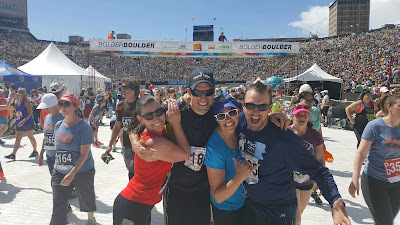 The race finished in the University of Colorado-Boulder stadium and they were showing live footage on the jumbo screens of everyone as they finished. What a unique experience, to see yourself on those big TVs! The Bolder Boulder had some of the best post-race snacks I've ever seen! After you finish, you get a bag full of food samples and a chocolate milk. We grabbed our goodie bags and made our way to the stadium seating so we could watch the pros race. 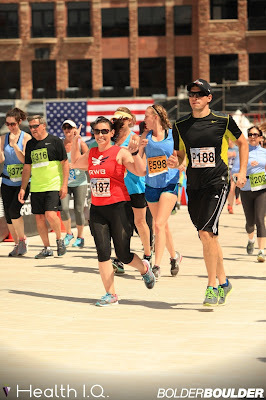 Crossing the finish line with my Texas Tech guns up! My race #ootd is my Skirt Sports redeptions knicks (I wanted all the pockets) and my Team RWB shirt. The Bolder Boulder is a race you must do at least once! But be prepared for the crowds and be prepared to drive around for a while looking for parking. Still, it was well organized, the race course entertainment was the best I've ever seen, and the race swag was pretty epic.